First, the Ferrari 458 LB Works Performance, a true rocket that you can now recreate using Hobby Design transkit on top of the Fujimi Kit. 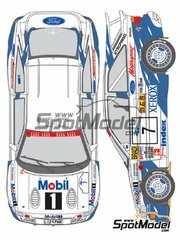 More rockets to follow up: BMW M1 Group A with the France map decoration racing at Le Mans 1980, with its spiky lines, a enormous spoiler, and an engine sound that scares you from its beauty. 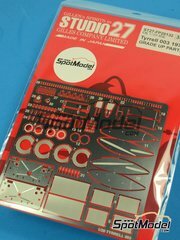 The decals are a Studio27 reedition for Revell kit, in a limited edition. Next, a Spanish rocket, and a classic one: the Pegaso Z-102 Spider that started to put hairs standing back on 1950. Drop dead gorgeous, featuring a fully detailed engine, and three different decorations. Be careful, last units available. 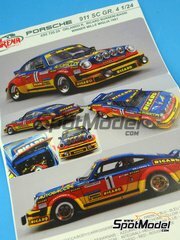 And for deserts, the classic rocket, the one you must have on the shelf: the Porsche 911 SC Group 4 from Arena, now with two new decorations from the Mile Miglia and Montecarlo. 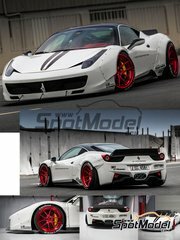 One of the most awesome transformations of the F458 was made by Japanese tunner LB Performance, and now you can recreate it in your kit with this excelent transkit. 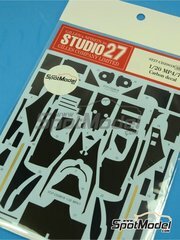 Inside the box, you have a good pile of decals, photoetches, resins and tyres for bringing Fujimi kit to life. One of the most unique and original decorations used by the M1 in his glory days, the one of the France map all over the car, now reedited for you by Studio27. Since it's a limited edition, you can easily miss yours so... run for it!! 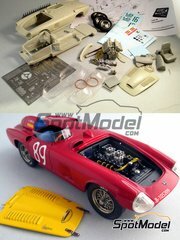 This is the most complete kit made by Escuderia24 since their origin, and the fittings are... awesome!!! The box includes a multimaterial kit with engine and bodyworks in resin, white metal and resin parts, photoetched preassembled wheels, photoetches, acetates and decals for three different versions. Driven by the recently deceased swedish rally myth Bjorn Waldegaard, with Hans Thorszelius as co-driver, this Porsche 911 SC group 4 tuned by Almeras brothers raced at the 1982 Montecarlo Rally. 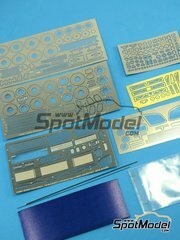 The kit includes a detailed engine and tons of resin parts and photoetches. 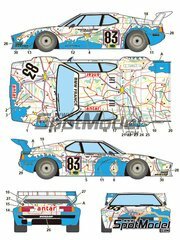 Here's the famous Porsche Ricard that collected lots of victories in the Italian national rallies championship in the early 80's driven by Nicola Busseni. 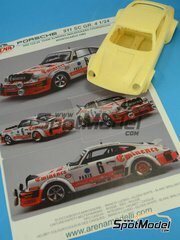 Tuned by Orlando Redolfi, this Arena kit recreates the winning version of the 1981 Mille Miglia Rally co-driven by Bassi. Inside the box, you'll find a great resin kit with the usual Arena quality. 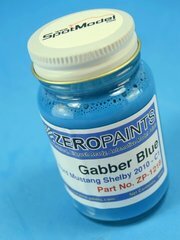 All paint supplied are pre-thinned for Airbrush use, they are thinned to a consistency which is suitable for Airbrushes with nozzle sizes of 0.3mm upwards. It is not recommended to over thin the paint, too much thinners and increase the chance of the paint becoming to HOT and affecting/eating the plastic below the primer. If unsure test first. 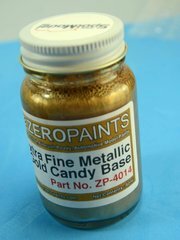 Apply a thick coat of this extra fine grain golden base first, and then apply a thin coat of Candy-like paint on top. Getting THAT magic effect will be a piece of cake. 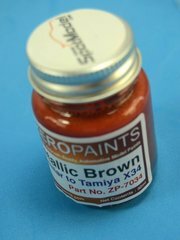 Zero paints have made this metallic brown tone to match Tamiya X-34 reference. As all the paints from this brand, you don't need to add any solvent since it comes already prethinned for airbrush use. 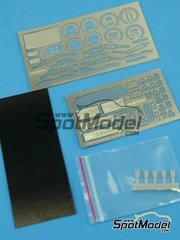 Do you want to improve your 003 kit? 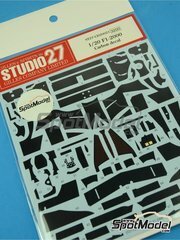 Here's the photoetch from Studio27 just for that, bringing to you the front and rear spoiler sides, new radiator grids, seatbelt buckles, bodywork pins, brake discs, pedals and many many other parts. Do you want the Marlboro logos in your McLaren? And you also want to airbrush the Goodyear logos in the tires? Search no more, here's a photoetched mask and a decals sheet plenty of logos for making your kit even more realistic. You won't dare to build Senna's car without the Marlboro logos, will you? And you even want to airbrush the Goodyear logos in the tires? 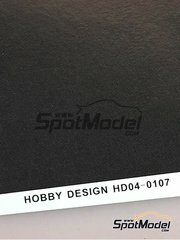 Well, Hobby Design has heard your prayers and released this reference specially thinking about you and your kit. Want to give a better look to your kits? Bucket seats, engine parts, fairings, bodyworks and lots of other parts will come back to life with these interesting decals that mimics kevlar. 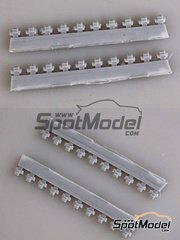 Here's an interesting set of electrical plugs for detailings in 1/12 and 1/24 scales, although you can also use them in 1/20 scale kits. 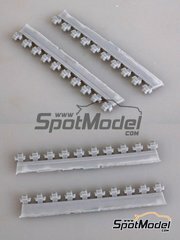 Set of twenty electrical plugs in resin to enhance the looks and detailing of your 1/12 scale kits. 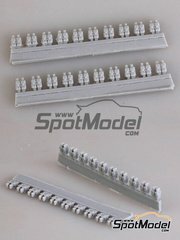 Set of twenty electrical plugs for detailing your 1/12 scale car and bike kits. Nothing less than twenty resin electrical plugs to improve the detailing of your cars and bikes. Are you going to miss them? 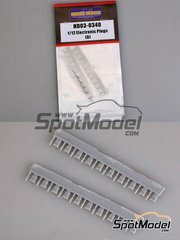 Here's a set of electrical plugs specially design to improve the detailing of your 1/12 scale bike and car kits. They're made in top quality gray resin. 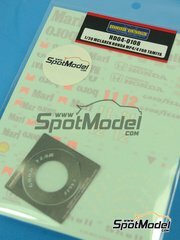 Accurately designed with 3D CAD tools, and made in Hobby Design smooth gray resin, these plugs will help you improving the realism of your 1/12 scale bike and car kits. 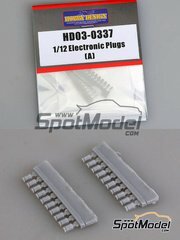 Nothing less than twenty 3D designed electrical plugs made in top quality resin for detailing your 1/12 scale bike and car kits. 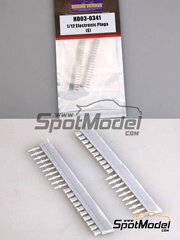 A complete set of 40 electrical plugs for detailing your 1/12 scale kits. 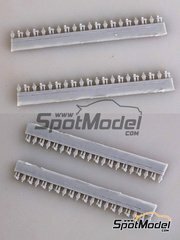 A set of twenty electical connectors made in top quality resin for detailing bikes and Formula One cars in 1/12 scale. 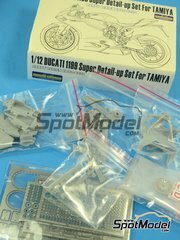 An interesting set for the best Tamiya kit, featuring two photoetched sheets, resin harness buckles and seatbelt fabrics. Here are the carbon fibre pattern decals of the MP4/8, a gorgeous machine with wonderful lines that Tamiya has just relaunched to market. Pay lots of attention, since these decals have been specially designed for this kit, and don't forget that both the kit and these decals are limited editions that will be available for a very short time. 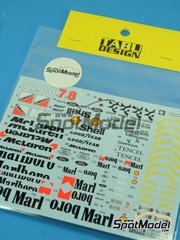 Here are the cabron fibre decals for the McLaren MP4/7 that we were all waiting for. Don't forget that both the kit and these decals belongs to a limited edition that will be available for a very short time. 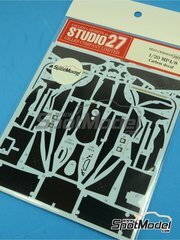 Finally you'll be able to build the F1 2000 kit with all the details thanks to these decals featuring the whole set of carbon fibre patterns of the car: engine areas, spoilers, cockpit and many other small parts. Do you want to see your MP4/8 with all the original sponsors? 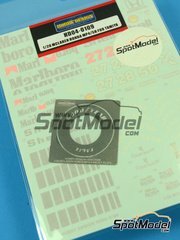 Don't miss the Marlboro logos and rubber stickers, and bring your kit to life. Do you want to see your MP4/8 shine in all its glory with all the sponsors? Don't miss the Marlboro logos and tire decals, and bring your kit to life. 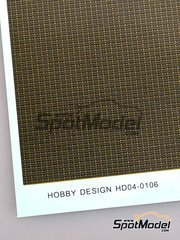 In need of a really small carbon fiber pattern? Search no more, this IS the decal your kit needs. 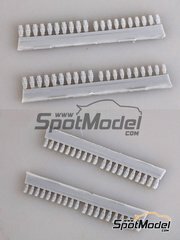 A thorough set of photoetches for the several different Fujimi short tail McLaren kits, including nothing less than six photoetches, metal turned parts and some other materials. Brake discs, grids, buckles, spoilers and lots of other awesome details. 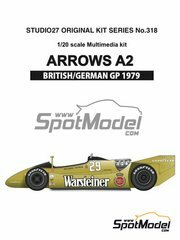 Again reedited by Studio27 in an edition limited to 200 units, here's the Arrows A2 that rode at Germany and England. A multimaterial kit in resin and white metal including rubber tires, photoetches and a whole lot of parts that you will enjoy for countless hours. 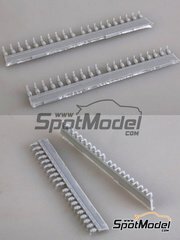 Under this Hobby Design reference you'll find an interesting detailing set for your Tamiya kit including resins, photoetches and metal parts for replacing the radiator, chassis sides, suspension, electric parts, racing stand, chain, brake discs, exhaust system and lots of other parts making your kit much more realistic. 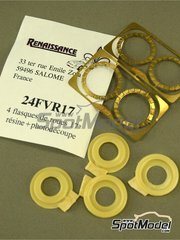 Group A cars frequently used venturi coolers to dissipate the heat from the brake discs, and now you can recreate them with this resins and photoetches set from Renaissance. 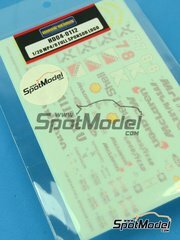 One win at the Portugal rally, and a second and third place at the Montecarlo rally, make this decal absolutely essential for your Tamiya kit. It belongs to a limited edition, so don't let it go. 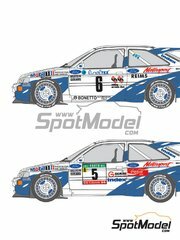 Shunko recreates with these sensational decals the decoration of the 1000 Lakes rally for your Tamiya kit. It belongs to an edition limited to 200 units, so... don't miss yours!